If the saying ‘quality remains long after the price is forgotten’ is true, then here is a perfect example of the style, quality and cost effective construction provided by Outside Concepts. 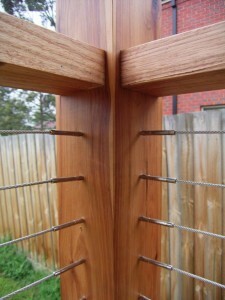 This close-up photo of a deck post illustrates the level of finish you will receive as a customer of Outside Concepts. When you install a new deck, pergola or patio you might also consider our most popular balustrade system featuring stainless steel wire. This system complies with the Building Code of Australia regulation (BCA) for decks up to 4 metres in height. Wires are spaced 80cm apart and require substantial tension to comply with the BCA. 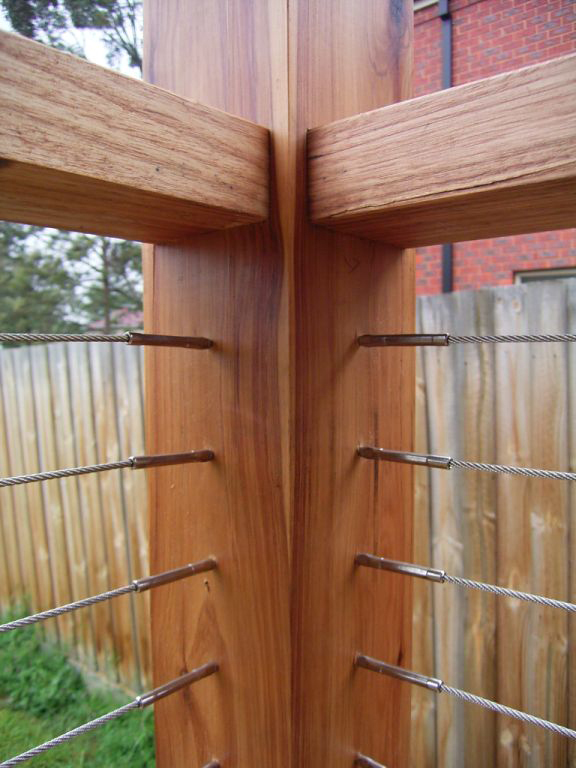 The optimum tension for the wire is determined by the spacing between deck posts. Your experienced Outside Concept professional will carefully calculate this to ensure your deck complies with all regulations and is safe for you and your family. Outside Concepts pride themselves on designing and building high-quality outdoor additions including decks, pergolas, patios and carports. All our projects are custom designed and built to suit your home, lifestyle and budget. And all our materials are finest quality; we only use known and recognised brands like Bluescope Steel, Capral Aluminium and a range of quality polycarbonates available in Australia. So if you want fine finishing, modern and stylish design and construction on your outdoor building project choose the team that is fully accredited, licensed, guaranteed and experienced – Outside Concepts.